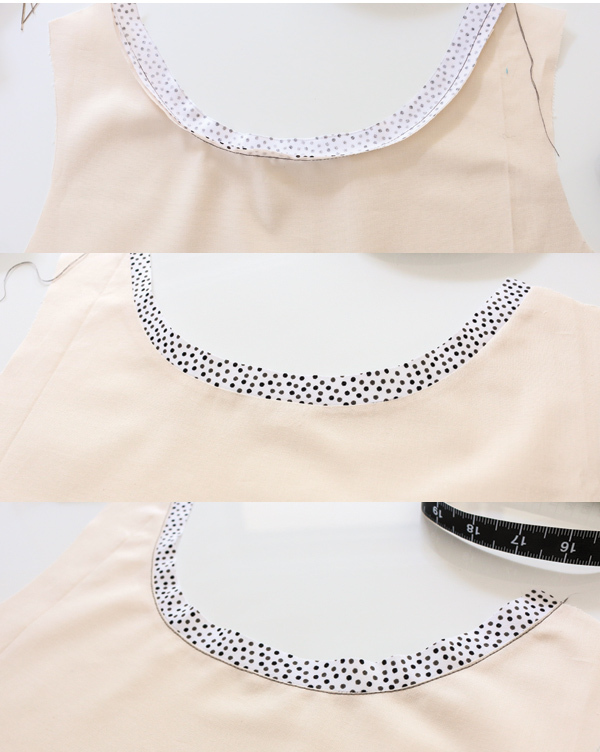 Necklines and armholes quite often are finished with a facing. While I do like facings and the clean finish that they create, sometimes its nice to not have all that extra fabric and instead use a binding to finish the edge. 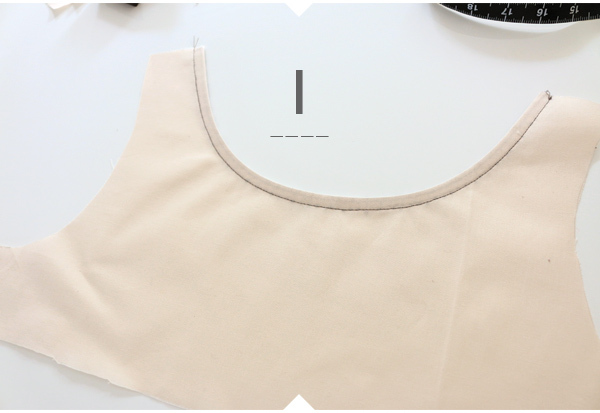 A bound neckline or armhole can give a clean and professional ‘ready to wear‘ look to your self made garment. It can be applied in a few different ways to give a different look and with this method its quick easy and fuss free. In industrial sewing, most bindings are applied with a special foot with folding attachment that uniformly turns and folds the binding as you sew. With this method though, no special feet are needed, all raw edges are neatly enclosed and it’s really quite easy. Using binding as a design feature + style line. In this example no binding is visible from the right side of the garment. The binding is sewn to the neckline, turned and folded to the inside and secured. The binding provides strength to the seam as well as finishing it neatly. This finish is suitable for light to medium weight garments such as blouses, dresses and tops. I like this finish because you only see a row of topstitching from the front. 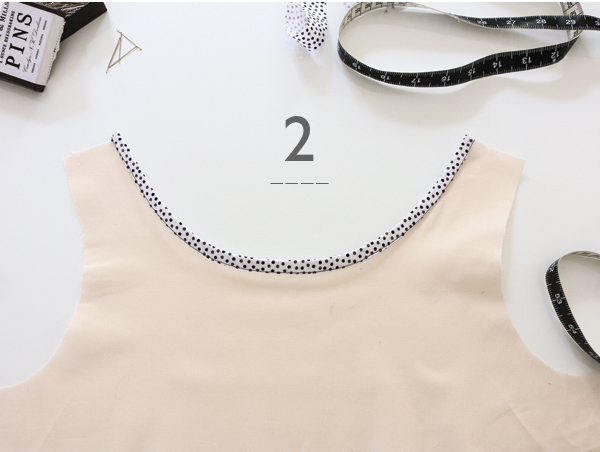 TIP to SEW FASTER: Make binding patterns that you can keep on hand for other projects, rather than having to work out the width of the bias binding strip each time. When making binding, cut more than needed and keep them aside for other projects. Our binding strips are 3cm wide for this example.They are a little wider than average because our binding gets folded in half (lengthwise) and the folded edge becomes the edge of the binding, enclosing all raw edges with no tricky folding and pressing. Desired finished width of binding (7mm) + extra mm’s (to allow for the turn of cloth, (9mm)), add seam allowance (6mm)** and double this (9mm +6mm = 15mm) x 2 = 30mm or 3cm. 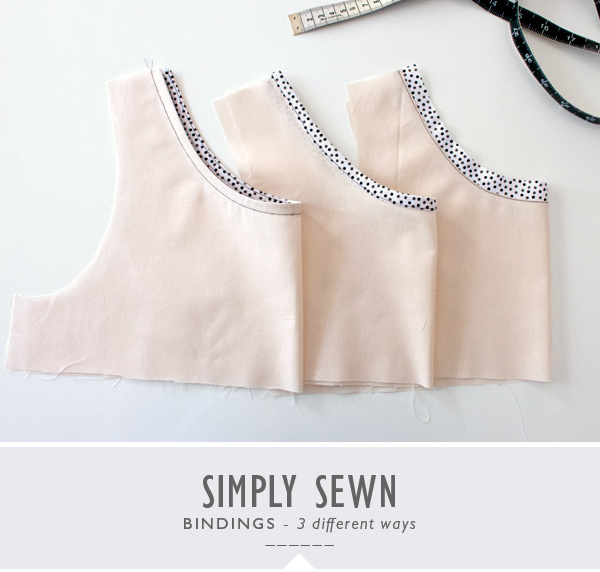 **When using binding as a finish, I like to follow industrial sewing standards and use a smaller seam allowance of 6mm / 1/4” rather than the tradition home sewing patterns of 5/8 “ or 1.5cm. 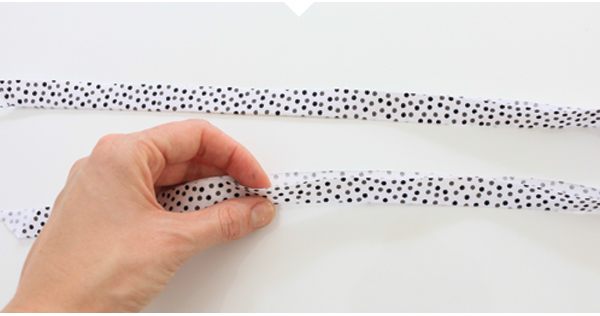 By using the smaller seam allowance you can sew curves much more accurately and you won’t need to trim, grade or clip the seam allowances. You may have noticed that when you buy prefolded binding, the seam allowances are made at 6mm / 1/4” , this is because the are made to the industry standard. Press binding in half lengthwise, wrong sides together. Working from the rightside of the garment, sew binding to garment aligning the raw edges. Fold and press binding to the inside and Edgestitch binding in place, using the folded edge of the binding as a guide. Binding can also be folded to the front of the garment, and topstitched, totally enclosing the raw edge of the garment in the binding. The binding in this instance becomes more of a feature, and could be in a contrast colour or print. Similar to the method above, we need to make an even wider binding piece, because in this instance the binding gets folded around both the rightside + wrongside of the seam we actually need to increase the width of the binding. The finished binding measurement gets multiplied by 4, add to this the doubled seam allowance. 40mm (10mm x 4) + 12mm ( 2 x 6mm) = 50mm or 5 cm. The only other alteration is we don’t have a seam allowance at all on our garment seam, 0cm, nothing, cut it all away as the folded edge of the binding must sit on the seam line in order to keep the integrity of the style. With the binding pressed in half as before, and this time working from the wrong side of our garment, stitch the binding and garment together using the 6mm seam allowance. I like to slighty stretch the binding around curves as I sew, to help it lie flat. Fold the binding up and over to the front of the garment with the folded edge covering our seam line. Press. Topstitch in place. Binding can also be used flat to edge a garment. Because the binding is cut on the bias the raw edges will not fray. 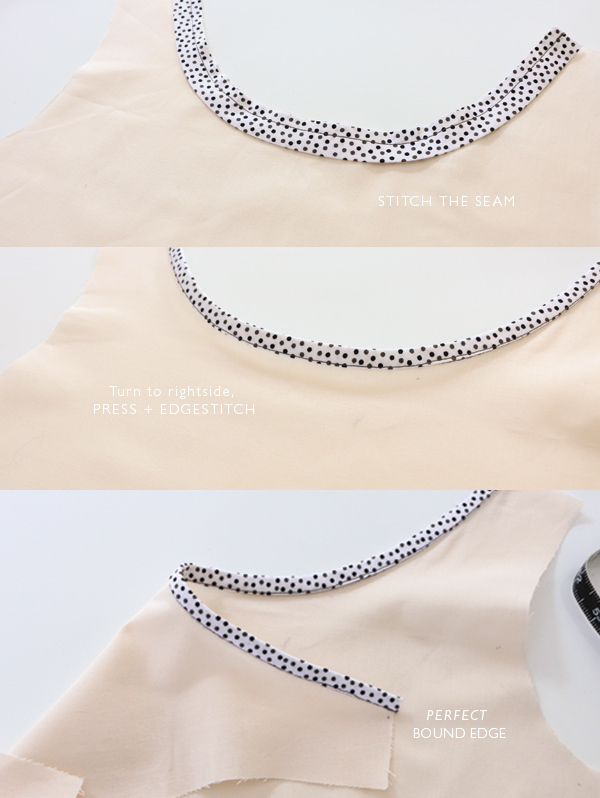 This gives quite an interesting fashion look to say an singlet or camisole or even a t-shirt neckline and I have used it in past garments, cut in a sheer chiffon on a silk singlet, it gives a lovely light contrast. The binding width is flexible, determined on style but not wider that 1” , (+ 1 x seam allowance). As the raw edge becomes our garment edge, we need to deduct the binding measurement from the pattern seam line so that the style line of the garment remains the same. Working from the wrong side of the garment, stitch binding to garment, aligning raw edges and stretching slightly around curves. Neaten the seams together and turn binding out with seams to the inside and press. I like to edgestitch the garment on the right side to keep the seam sitting flat. 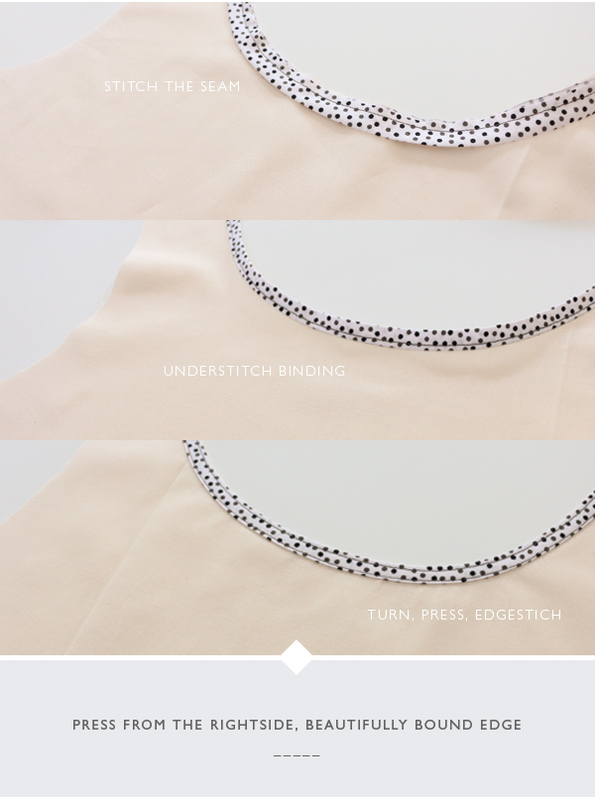 So next time you are finishing a neckline, maybe try a binding in one of the methods above and I’m sure you will love the results as much as I do!